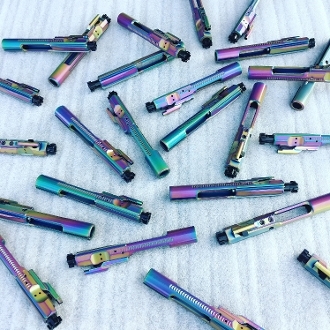 Our premium quality BCG in a new crazy rainbow galaxy cosmic psychedelic purple haze oil slick multi color eye-catching finish! If you want a unique Ar15 bolt carrier group that will stand out, this one is for you. Note: Colors may vary, no two are the exact same. Finish may change color over time, especially at wear points. As with all bcgs, keep it lubricated. We stand behind our products guarantee that the bcg will function properly.